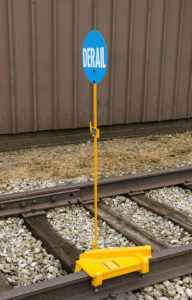 PD-6 portable derail with a PDF-LP staff assembly and a BF-2D derail flag. Staff assemblies and signal flags are sold separately. Available in left and right hand throws. 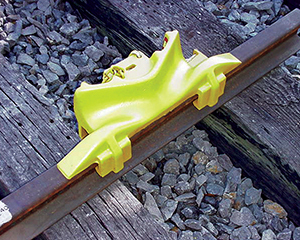 Covers broader range of rail sizes from 70 lbs to 141 lbs. Designed specifically for use in mines.